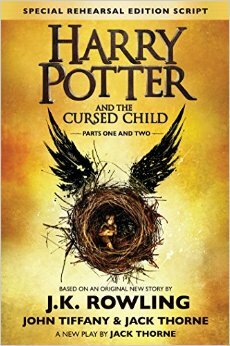 Based on an original new story by J.K. Rowling, Jack Thorne and John Tiffany, a new play by Jack Thorne, Harry Potter and the Cursed Child is the eighth story in the Harry Potter series. [Cursed Child is] a compelling, stay-up-all-night read ... this play nimbly sustains itself simply by situating its canny story line in that world and remaining true to its characters and rules. As in the books, the suspense here is electric and nonstop, and it has been cleverly constructed around developments recalling events in the original Potter novels. Harry Potter and the Cursed Child is the bare-bones script of a play. And yet, it has the same addictive drive as Rowling’s novels ... Thorne has by some sort of alchemy written a book that I would previously have assumed only J.?K. Rowling could write. The humor is Rowling’s, as is the tightrope-with-an-umbrella execution of a formidably complicated plot and Rowling’s sturdy, pragmatic morality, where the high cost of doing the right thing is nevertheless worth paying. It’s ambitious, studded with predictable and consequently satisfying twists that reach a critical mass in the finale. This feels very much like Rowling ... Even in the relatively fixed future where most of Cursed Child takes place, the characters are the right degree of surprising. Harry Potter himself has been so thoroughly, faithfully imagined since 1997 that it’s satisfying to see him as a crappy father and an awkward bureaucrat ... Without set decoration, it cleanly shows the moral imagination of the Harry Potter universe, in which goodness is circumstantial and endings are never guaranteed.